Iceland is known for its vast wilderness and stunning geography. The small country is a hikers paradise with virtually any region of the island nation offering unique and beautiful hiking trails for every skill level. But visiting Iceland with kids doesn’t mean you need to stick to the Blue Lagoon and Reykjavik. 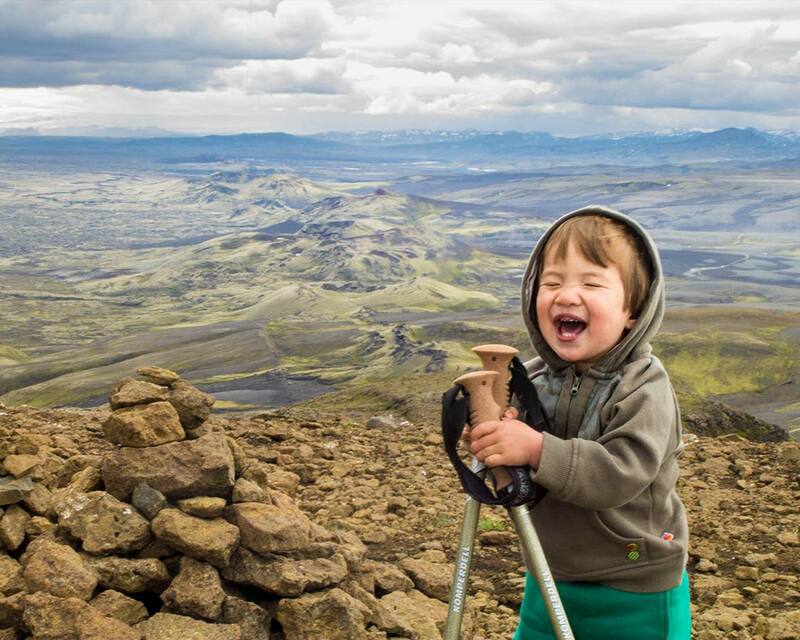 Here are some of the best hiking in Iceland with kids. 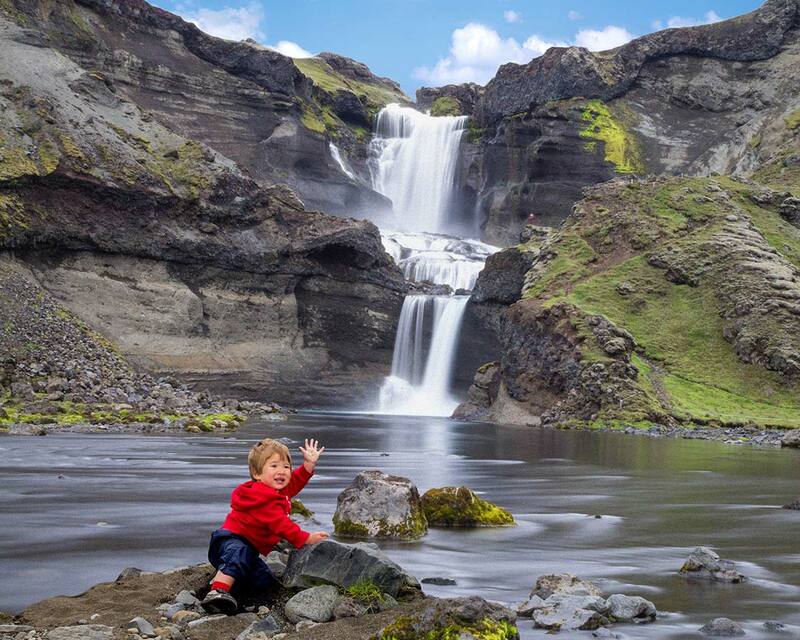 What are the Best Hikes in Iceland for Families? 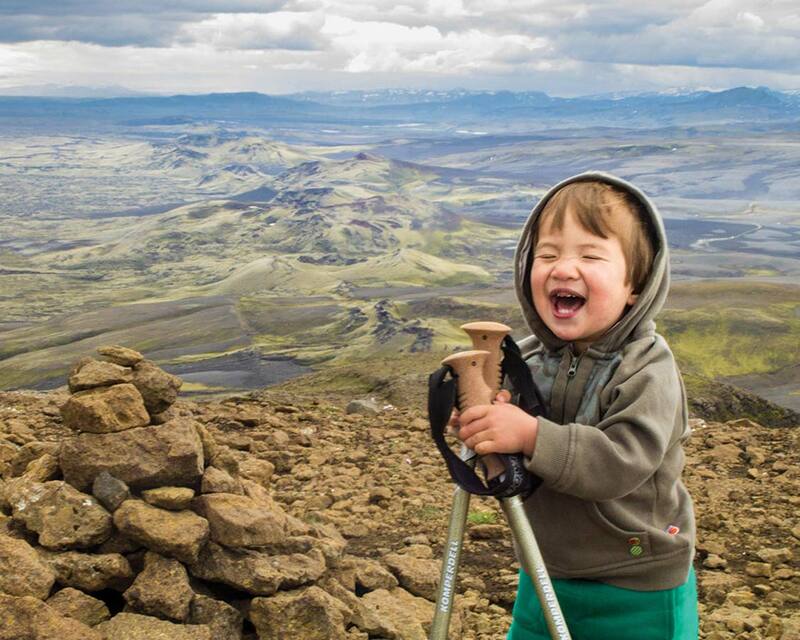 A family friendly hike in Iceland can mean a lot of different things to many different people. When we choose our hikes, we try to look at distance, required skill level, and the ruggedness of the terrain. Because our boys are still quite young (and in the case of our Iceland trip, only 1-year-old) we needed to carry C in many places. 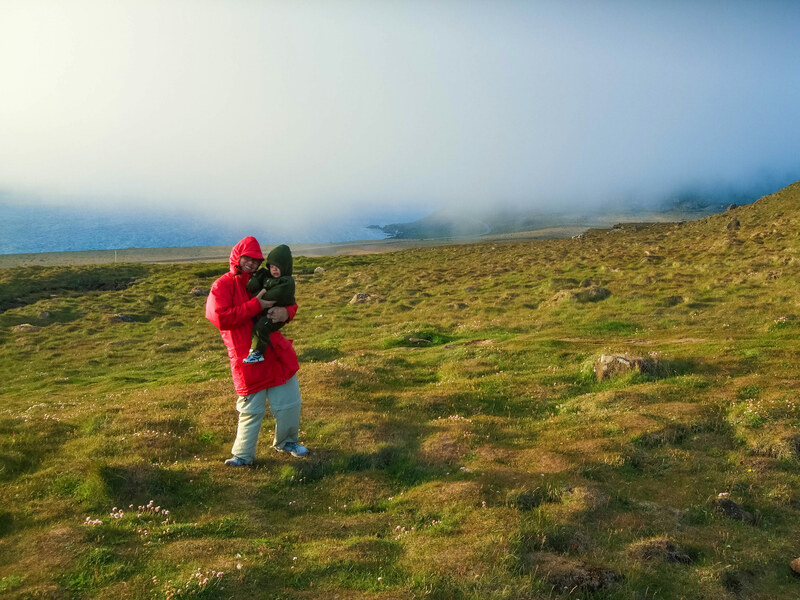 But we chose our list of the best hikes in Iceland for families based whether our hiking-savvy boys would be able to handle them now (ages 3 & 6). 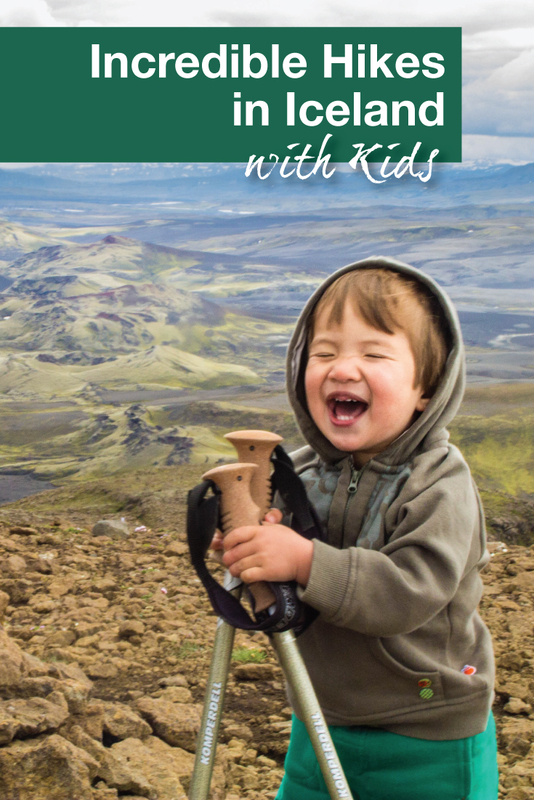 How to Prepare for Iceland Hiking Tours with Kids? Weather in Iceland can swing dramatically. Icelandic summers are calm and comfortable, but can get cold, especially if it rains. If you are visiting Iceland in winter, make sure to dress appropriately, as the weather changes can be much more dramatic. No matter what the season, it’s best to dress in layers. This is especially helpful if you are hiking in areas with large elevation changes. 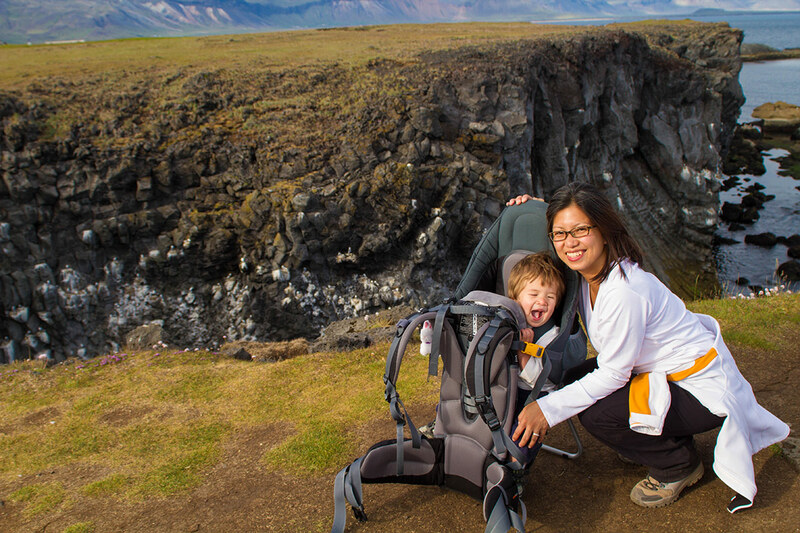 If you are exploring longer Iceland hiking trails with children, it’s also recommended that you bring a child-carrier. You can find our breakdown of the best child carriers for travel here. We recommend wearing shoes with good grip no matter where you travel in Iceland. Much of the landscape is rocky and uneven, so twists and sprains can occur if you don’t have good soles on your shoes. Wear shoes that have good ankle support, but breathe well. We have had excellent luck with Merrell hiking shoes on our travels, but every foot fits differently so find the best hiking shoe for your build. If you plan on hiking Iceland in winter, take into consideration warmth. The best hiking boots for Iceland in winter need to breathe, but also offer grip and warmth. They should also have a higher cut to help keep snow out. The Colombia Bugaboot is one of our favorite winter hiking boots. 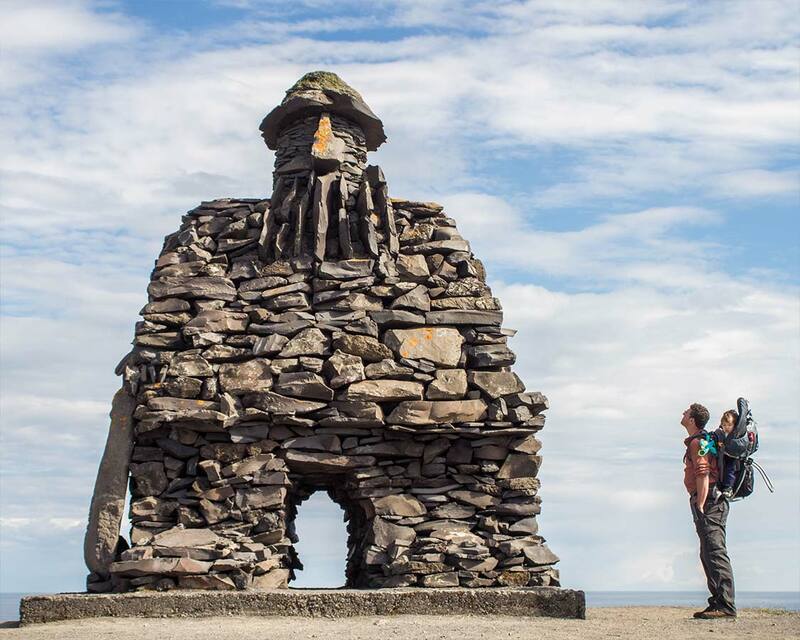 Located in the Snaefellsness Peninsula, this hike takes you along craggy cliff tops and through an old and interesting pass between the towns of Arnarpstapi and Hellnar. The region was made a Natural Reserve in 1979. Along the path we came across basalt columns and small and scenic ravines. And we could spot grottoes deep down near the bottoms of the cliffs. 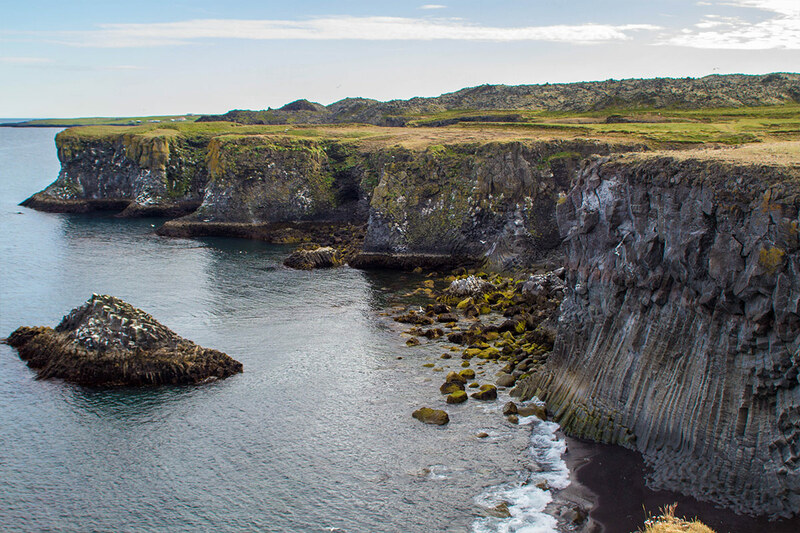 The cliffs are teeming with bird life such as Arctic Tern, Fulmar, and Kittiwakes. Our hike in Arnarpstapi was the start of our trek Iceland experience, and starting the trail we felt like we needed to pay our dues. The trail head is guarded by a massive statue of the giant Bardur. The statue peers out on the stunning Mt. Stapafell watching over hikers as they enter the trail. We explored the 2.5 km of rocky terrain. The path itself is fairly easy to follow but may entail some light climbing, especially if you wander off the main path to explore. When we reached Hellnar we found the Fjoruhusid cafe. This small place had some delicious local food on the menu. The view from the restaurant is worth the trip alone. But the food gave us the energy we needed to make the trek back to Arnarstapi where we had parked the car. Located in one of the most remote sections of Iceland, the bird cliffs in Latrabjarg are worth the journey. If you can manage to get to the easternmost part of Iceland’s Westfjords, you’ll be greeted with towering 441m high cliffs. 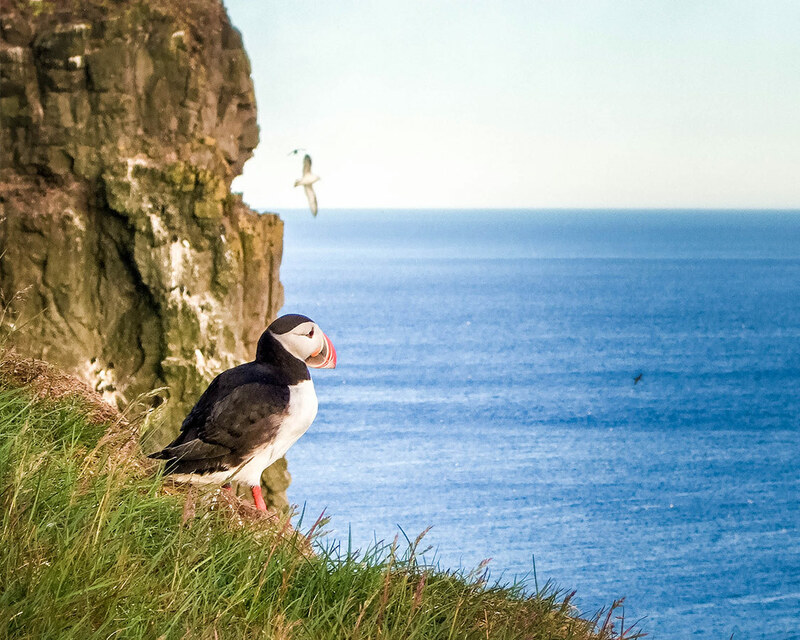 And these cliffs are stock full of birds, including one of the largest puffin colonies in the world! These adorable birds litter the walls of the cliff in such sheer numbers that it is impossible not to feel like you can reach out and touch them. But don’t. There is nothing but a painted white line or string separating you from a long fall into the frigid Atlantic waters. Pro Tip: While we consider this to be one of the top family friendly hikes in Iceland, be sure to keep a very close eye on your kids. The hike in Latrabjarg is easy, but the cliffs have no safety measures and the drop is unforgiving. Latrabjarg offers some of the most unique trekking in Iceland. The cliffs stretch for 14 km and the entire length can be walked with relative ease, making the hike as long or as short as you would like. And the views along the rim are spectacular! 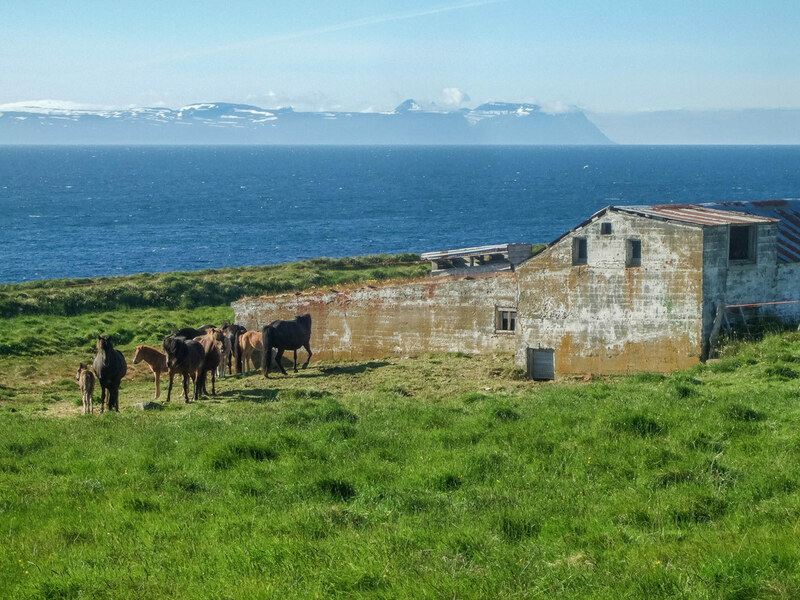 The Vatnsnes Peninsula in Northwest Iceland is full of beautiful Icelandic horse farms. This region makes for a spectacular drive and a scenic region to explore. But be on your guard, during mating season the Arctic Tern here are like tiny kamikaze. They will fly straight at your head and chase you back to your car. Admire the views with caution! Pro Tip: The birds here are seriously crazy. Watch your hair. But the real claim to fame of the Vatnsnes Peninsula is Hvitserkur. This 15m tall monolith stands alone amidst the crashing waves of the Atlantic. 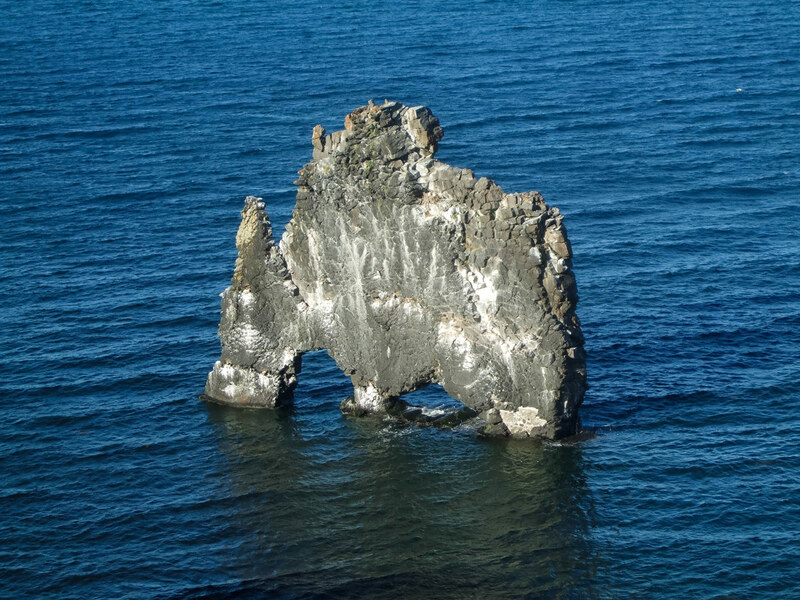 The legend of the sea stack is that it was once a troll who lived in Strandir. The troll wanted to tear down the bells at Thingeyraklaustur convent because it didn’t like the sight or sound of the church and it’s bells. Legend has it that the troll was caught by the daylight before it had a chance to enact its revenge. Hiking Iceland to Hvitserkur involves an easy trek to a viewpoint at the top of the cliffs or an easy walk to the coast from the parking lot. Just be careful in the summer, as the cranky arctic tern might decide to dive bomb you and make the hike far more adventurous! The trails here are narrow and grassy, but well maintained. But take caution as the cliff edges are steep. Iceland Hiking Trips around Lake Myvatn, near Husavik offer a plethora of incredible and varied landscapes to explore. The area around the Lake Myvatn itself is absolutely beautiful and the region is lush and green during the summer months. The well-maintained paths make the hike very family friendly. 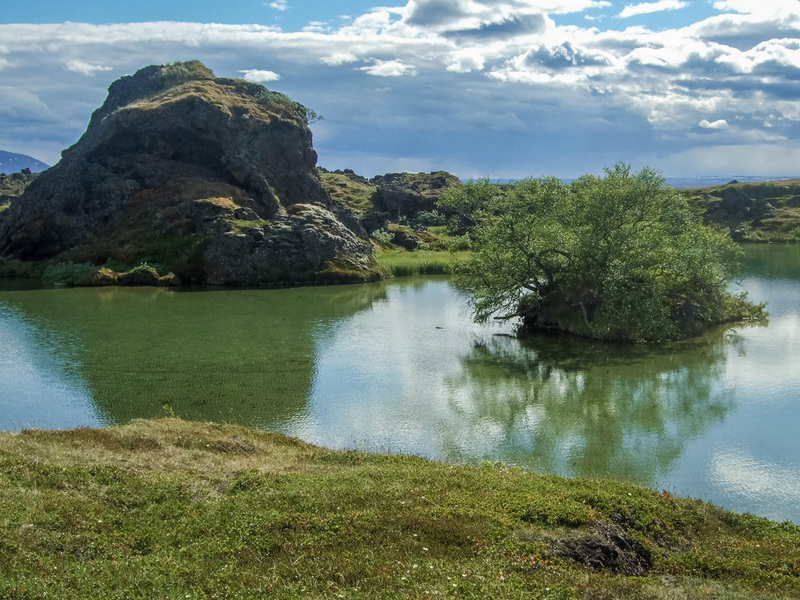 Lake Myvatn is nearby to the magical Dimmuborgir. Here there are rock formations unlike anywhere else found on land. These dark and jagged formations stand against the sky in ways that almost defy understanding. 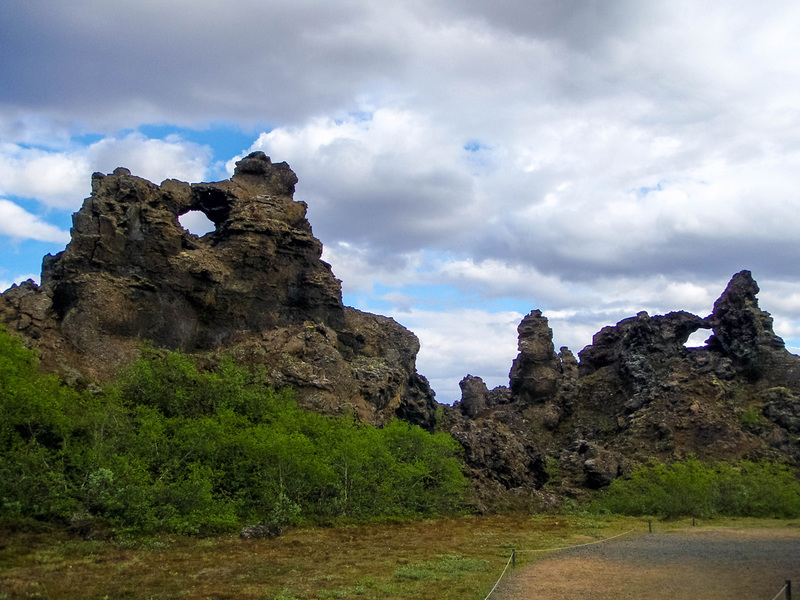 The paths along Lake Myvatn and Dimmuborgir are well maintained and easy to follow for any age. 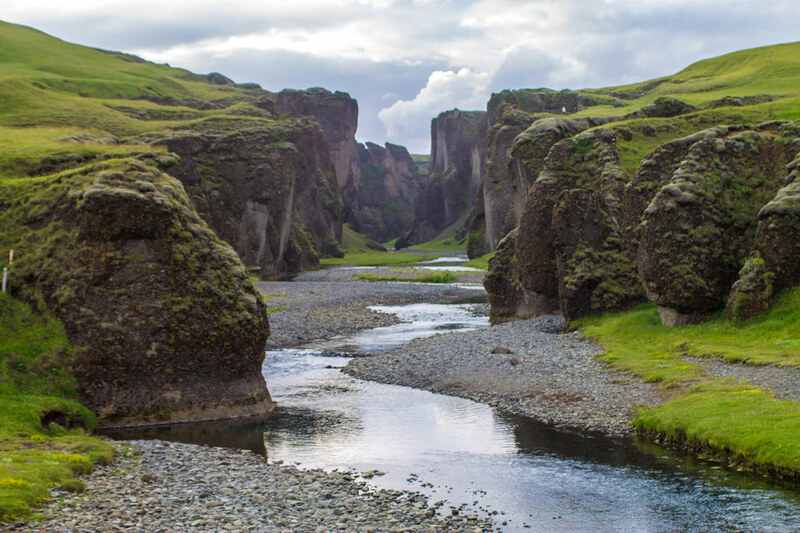 Our hike through Eldgja Canyon took us along a meandering shallow river towards Ofaerufoss. 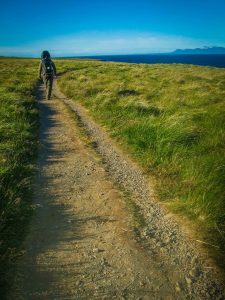 This hike in Iceland is relatively flat and easy but can be a bit muddy in parts. Once we reached the falls, the view was very pretty. Apparently, there used to be a stone arch across the lower one up until the year 1993, when it fell into the river during spring thawing. There are rocky paths on the side of Ofaerufoss. The climb along the falls is steep and a bit precarious. Also, getting to the falls requires crossing the river. This should be done very carefully, and make sure to check the depth before you step. 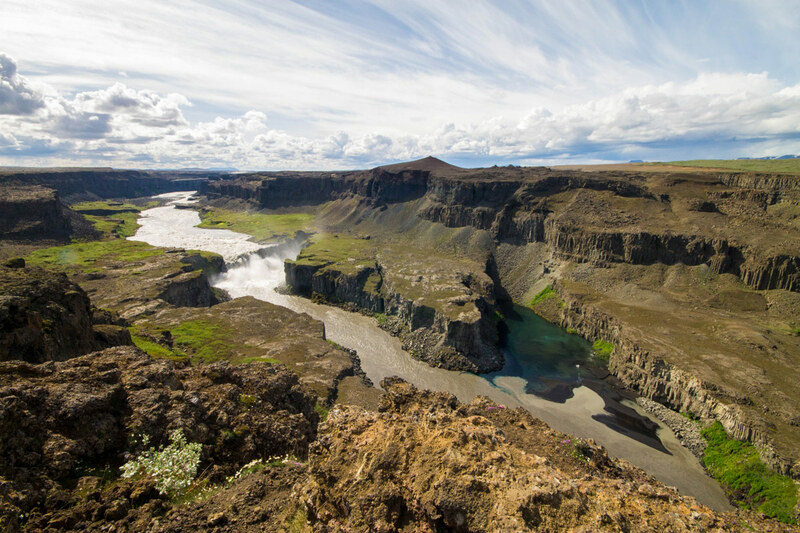 Located in a valley between Dettifoss and Asbyrgi Canyon sits one of the most mind-blowing landscapes in all of Iceland. And that is saying a lot! 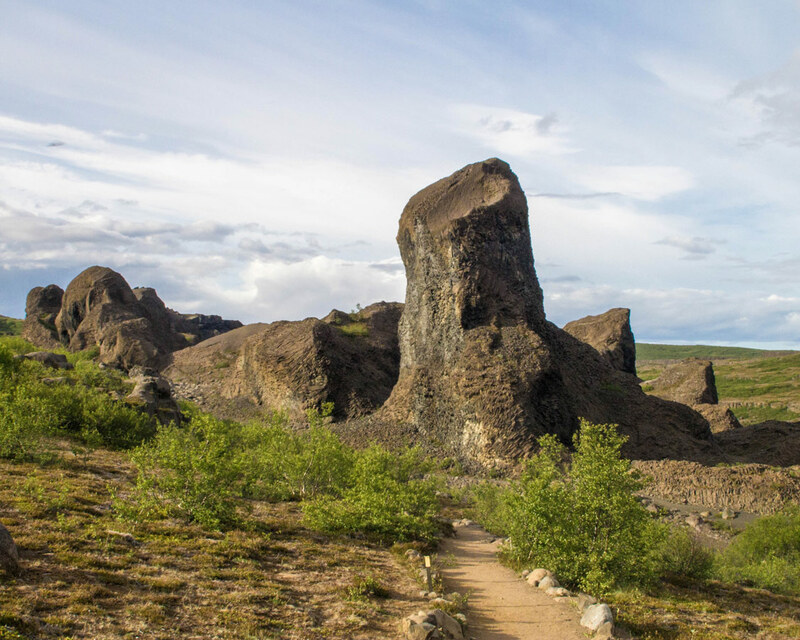 The highlight of the region is Hljodaklettar where you can explore over, around and through wild basalt columns that don’t even look like they should be possible. 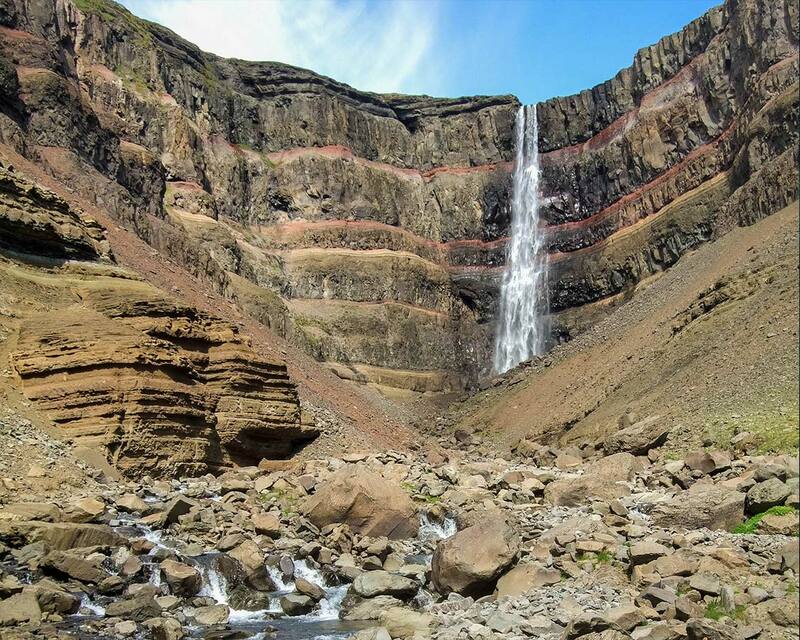 The Iceland hiking trails at Vesturdalur and Jljodaklettar run along and crosses Jökulsá á Fjöllum where many of the most famous formations lie such as Kastali, the Castle. Make sure to check out the spiraling basalt, and the cave where it looks like the earth was simply folded up in an effortless push. The paths here are well maintained, but there are a lot of opportunities to explore caves, rocks, and hills that require some climbing and good hiking shoes. Just north of Vesturdalur lies the famous waterfall, Dettifoss. The falls roar like thunder and the surrounding canyon makes for a scenic view. But when we made the short hike upstream to Selfoss, the view got even better. 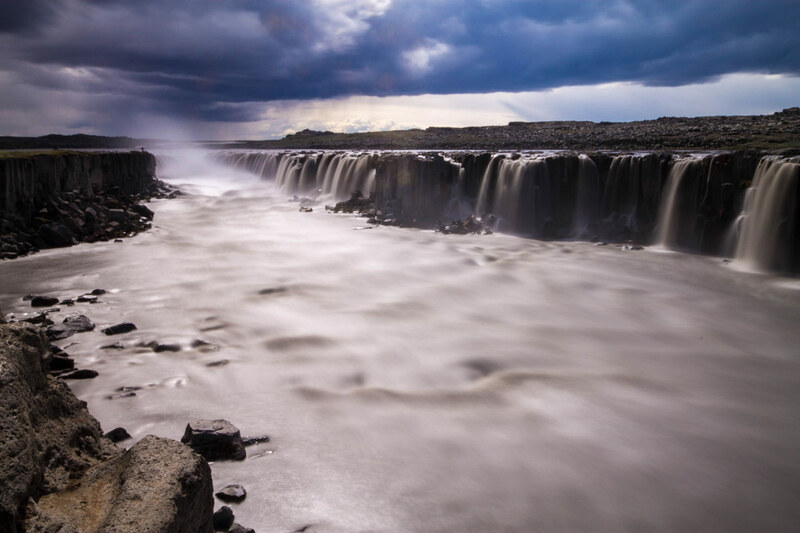 Selfoss, while not as large, has a much more dramatic look to it and shouldn’t be missed. Hiking to Selfoss involves a trek of 2.5 km. The hike involves maneuvering over over some rough terrain. While the distance is not very far, small children might need help scrambling over some of the cracks and boulders. Hengifoss, located off 931 south of Egilsstadir, is the third highest waterfall in Iceland at 128m. The hike to Hengifoss is deceiving. From the parking area at the base, it looks like a short jaunt up a steep hill to get to the falls. But just when you think you’re there, you realize, “nope, this is just the bottom waterfall”. And then you keep climbing. But the views along the way are unforgettable. And the stream at the top makes for a great place for kids to splash in the cool glacial water. 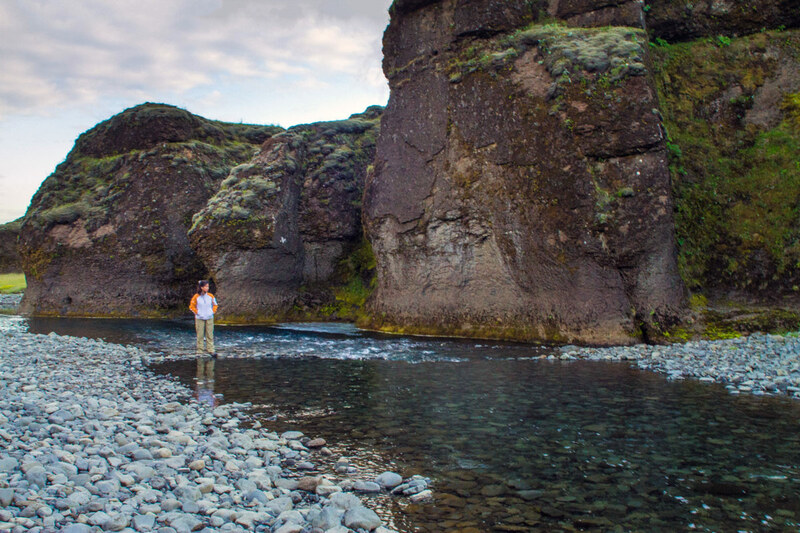 Located off the Ring Road, just south of Kirkjubaerjarklaustur is Fjadrargljufur Canyon (that’s a mouthful isn’t it). The narrow canyon stretches for 2 km amid steep 100 m cliffs. The canyon floor can be trekked but requires some wading through shallow water and along some small waterfalls. There is also a path along the canyon rim for those who want to keep their feet dry. We opted to do a little of each, and the views from both are simply amazing. Although the stream is shallow, the water is chilly. Make sure you have waterproof boots. The rocks can also be slippery and unstable, so watch your step, especially on the upper canyon where the fall is quite high. The region of Laki is named after the volcano of the same name that erupted in 1783, nearly destroying the nation of Iceland. As devastating as the original eruption was, it left behind a stunning series of craters that stretch for 25 km. The area is full of incredible rock formations and lava tubes. Some of the formations have steep drop offs, and some of the craters are still steaming. So if you are visiting with younger children, make sure you keep them within arms reach. Laki is very difficult to get to and requires a 4wd or AWD to make the journey. Some bus tours will take you there, but unless it’s a hiking specific tour, you may not have much time to explore. Make sure you hike to the top of the hill nearest the main parking area to get the overlook along Lakigigar Crater row. It’s an unforgettable view. 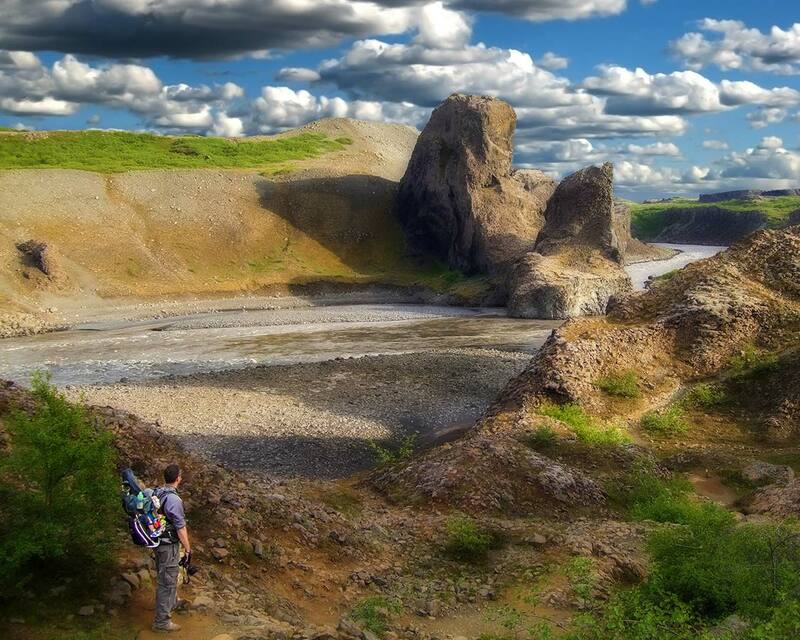 Landmannalaugar is one of Iceland’s most popular, and epic hiking destinations. Located at the end of F224 off of F208. 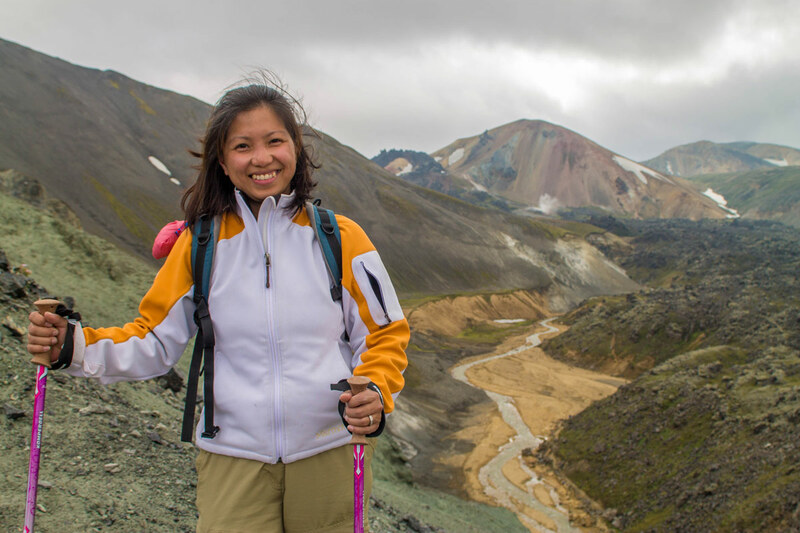 Hiking Laugavegur can be done in a few ways, including a 5-day through hike to Thorsmorko. C wasn’t enjoying the wind that day and combined with being tired, he convinced us to change our route. Instead of hiking to the hot springs we opted for some shorter routes exploring around the incredible rolling hills near the entrance and some hikes along the lowlands surrounded by incredible mountains. Pro-Tip: When hiking with kids, let them set the pace. Don’t be afraid to change your route and make alterations if they aren’t enjoying it. That way you can build good memories of outdoor activities. 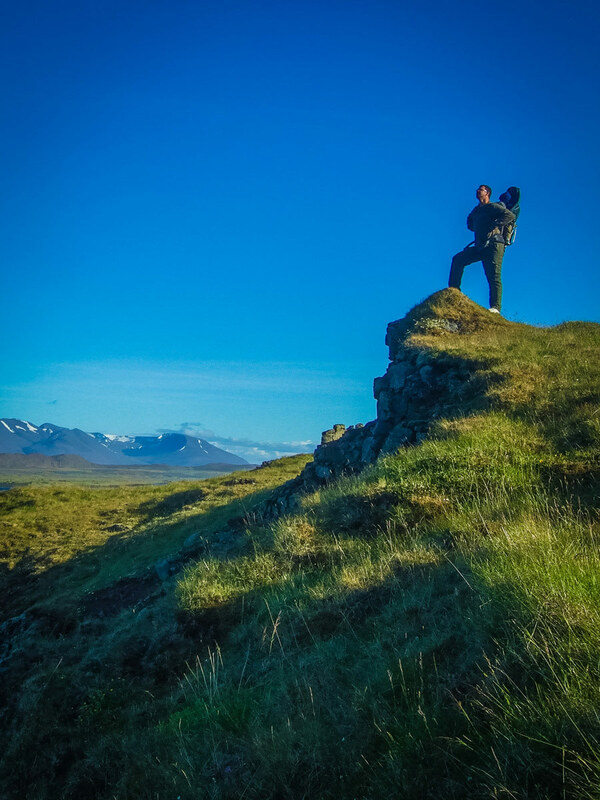 Hiking is a great way to spend some time outdoors and immerse yourself in the incredible scenery that Iceland has to offer. But like any outdoor activity, it’s important to make sure that you do it safely and responsibly. Bring good quality hiking shoes, even for the kids. Make sure others know where you are planning on hiking. Set a return time so others know when to expect you. 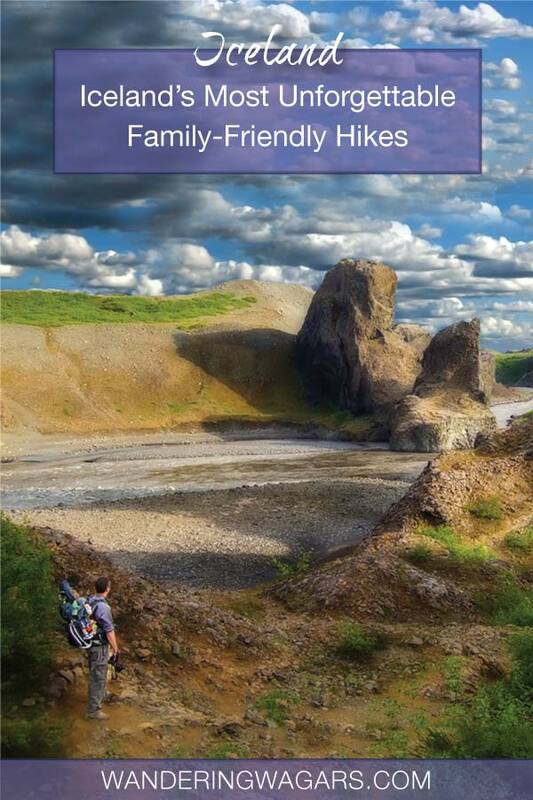 Did we miss any great family-friendly hikes in Iceland? Let us know in the comments below! Iceland looks stunning. I bet your kids must have really enjoyed discovering this beautiful country. It looks like you saw many beautiful landscapes, falls and lakes. Thank you for this! We’re going next month and I’m researching hikes right now! Have an incredible time! It’s a great country to explore and there are too many incredible hikes to count! Such great tips. I’ve hiked with my daughter a fair bit in the Rockies, but we’ve never done a trek overseas. I was nervous about it, but after reading your post I see it’s really no different. The landscape in Iceland looks incredible! Absolutely stunning images! 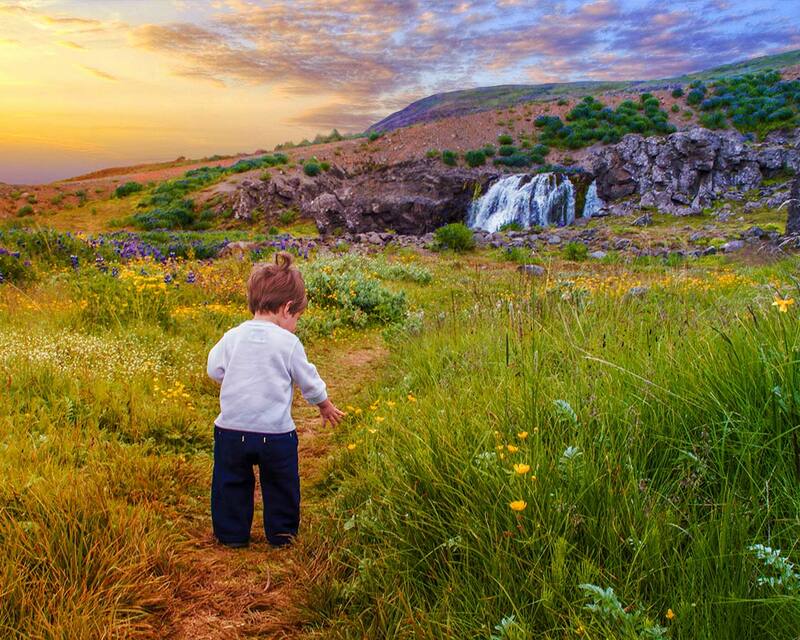 Iceland looks incredible and these hikes seem like amazing choices for any age, kids or not! Great post! AMAZing photos! And obviously an amazing landscape. We’ve been divebombed by nesting seagulls on a Scottish island before. Must be a seabird thing! Cool you got to see some of the Icelandic horses too. Iceland looks incredible. Yeah I agree, don’t walk further than you can carry. Kids always want to be carried at some point. I love the cafe at the end! 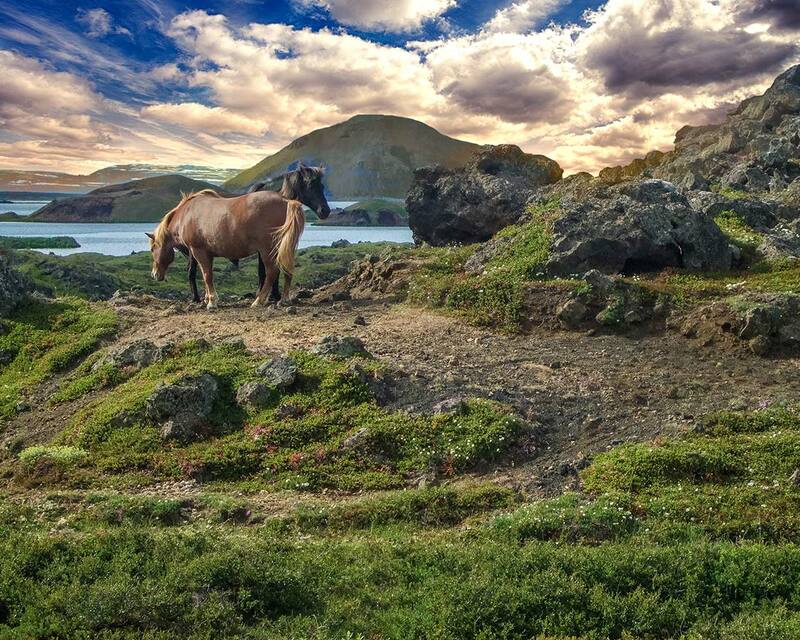 Wow, Iceland looks like a stunning country. I may even take up hiking for scenery like what you are sharing! I don’t have the kids but happy to go to as many of these places as we can. Off to Iceland on 29 May for 9 days so really looking forward to visiting some of these places. So want to see a puffin as well. Sounds like you’ll have an incredible time! Are you heading to the Westfjords? Hi Kevin, thanks for this post. We were in Iceland two months ago with our one year and a half son and it was without a doubt the most magical country we´ve ever been to. It´s nice to hear that your kids could enjoy it as well. We will definitely go back again when our son grows older so that we can follow those hikes you did. Cheers! Thanks once again. I’m so glad to hear that you had as incredible a time as we did! Iceland really is magical. Yes! better than we´ve ever imagined it would be. Safe travels!